If you are more of a night hunter, then the Ecoopro Trail and Game Hunting Surveillance Camera for Wildlife Monitoring might be the one for you. It has a lightweight, and it is perfect for use in hunting trails and when you decide to hunt games. It has a 12MP camera resolution that will enable you to capture clear, profound and high-quality images and with a 1920 x 1080 HD video resolution, It can record and get high-quality videos with automatic clear audio sounds. It is also built to have 24 pieces of low-glow IR LEDs that cover up to 65 feet/20 meters distance in daytime or even in the night but it best suitable for a night vision. You may also program your device to display the date, time and moon stamps when capturing images and videos. Also, it contains a time-lapse mode that enables you to take images of your desired and selected intervals. This game trail camera can be on standby for about six months with 8 x AA batteries in it. It can also hold up and extend its memory for it designed to have a memory slot that can manage up to 32GB and you do not have to look hard because it uses the common SD cards for cameras. It is designed to be waterproof, so you may use this on the trail and game hunting whether the weather decides to rain or shine. The item is a free shipping purchase, so rest assured that wherever you are, your order will come to you hand in hand. It is manufactured by Ecoopro itself, sold by ECOO and supported by Amazon. The package includes the trailing camera, USB cable, mounting belt, and a user manual. The manufacturers and producers assure you that their friendly and approachable customer service is open 24 hours, money can be returned within 30 days, and if you do decide to purchase this product, you are guaranteed with a 12-month warranty. When it comes to durability, this camera can tough it up because it can withstand the rain for long periods of time. You can also leave it where you want to leave it. Because aside from being highly waterproof it has a threaded hole on the bottom of the camera where tripods can be mounted or attached, and there is also a space for the straps in its back bracket that makes it practical to be used and be left outdoors. The camera also has an impressive fast triggering or shutter speed that can be is designed to have up to 0.5 seconds, it also is programmable and can be set to 0.2 seconds. You are guaranteed that there will be no single delay in the trigger between the moments of capturing your subjects and surely, you will never miss any exciting individual moments and game because you can also use its multi-shot feature which can take up to 3 pictures at each given time. Also, this camera may be used to have three capturing modes, So, you can decide whether you want to set it up to the camera for images, video, or camera + video. 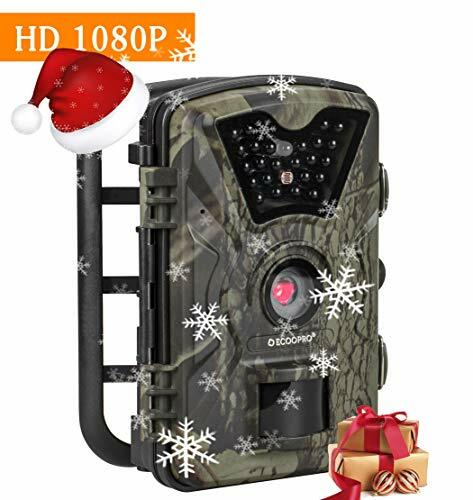 It is also convenient to use when in hunting trail or hunting games for it has 2.4” colored TFT-LCD which enables you to view immediately whatever you have captured. This product has been rated 5.0 out of 5 stars, and some of the owners of this camera say that is perfect for beginners. According to some buyers, their expected quality from upon the purchase has gone beyond expectation, because they expected a typical so-so one. It’s very lightweight makes it handy so that you can bring it anywhere and anytime. The quality materials used to make the camera is also one thing that makes the whole product a great one. The LCD screen with screen protector amazes many because of its high and well-defined quality which is perfect for viewing the captured images and videos. Also, the navigations buttons are responsive and work so well. The menu is easy to deal, and users can be learned quickly because of its precise function and navigation. There are just a few negative comments and disappointments that are being raised regarding the product. Some are disappointed with it because its external memory capacity can only hold up to 32GB and some wishes to have it up to 64GB. Some also say that it does not have quite an excellent result or crystal clear of quality when they use it at night. Overall, the camera is worth the price. It is highly recommended because of its lightweight which makes it handy and the quality of materials being used is excellent. The camera has also exceeded the expectations of most of its buyers. Weighing both the pros and cons, this camera is one to be placed on the list.